Will Pottinger was pleased with a point after seeing his side edged out 46-44 in a Championship Shield clash at Peterborough. Nick Morris, battling illness, rode superbly and teamed up with Adam Ellis for a last race maximum which secured the consolation point. And Pottinger said: “It’s a good result considering we were 12 points down at one point and we could have even come away with a win but for a couple of moments of ill fortune. “Making a comeback from that many points down shows great resolve by all the riders. It’s a point that could prove to be crucial. Nick did a great job considering he wasn’t feeling very well today. He’s a great rider to have leading the team. Hammers had the better of the closing stages with reserve Zach Wajktnecht twice taking the flag – but Michael Palm Toft’s second place in a hard Heat 14 battle with Kyle Newman proved crucial, especially as the visitors collected a 5-1 in the last race. 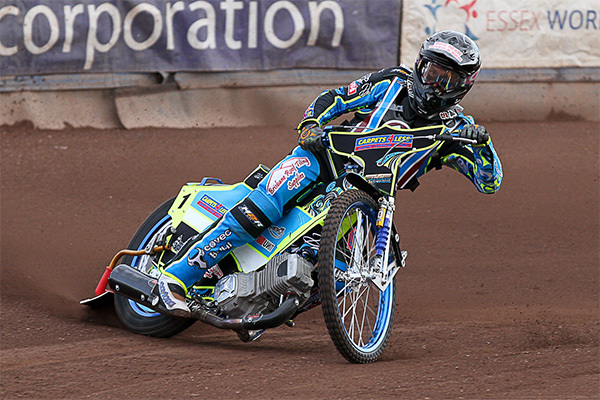 Eleven of the fourteen riders on show won at least one heat, with Emil Grondal the stand-out performer for the home wide with paid-12 on his return to the team. Lakeside provided all the last five race winners, three from Morris who took Heats 11 and 13 with his partner at the rear – whilst Wajtknecht and Ellis reduced the arrears to eight with maximum points in Heat 12. Kyle Newman was forceful on Michael Palm Toft in Heat 14 in an incident which assisted Wajtknecht to the front, but the Panthers man was determined to salvage second place and his re-pass on Newman was a vital move. Morris and Ellis duly secured a Lakeside 5-1 in Heat 15 to notch a point. PETERBOROUGH 46: Emil Grondal 11+1, Ulrich Ostergaard 9, Michael Palm Toft 8, Simon Lambert 7+1, Scott Nicholls 4+3, Tom Bacon 4+1, Nike Lunna 3. LAKESIDE 44: Nick Morris 11, Adam Ellis 10+2, Zach Wajtknecht 8+1, Richard Lawson 7, Kyle Newman 4+1, Ben Morley 4, Alfie Bowtell 0. Thanks to @lakesidelive for heat updates.